As we go through childhood, we pass through multiple stages of development. This seemingly generic statement is fraught with exciting new concepts, skills, and emotions, yet the pressure and stress associated with growing can be a lot for young children to handle. Any child that was adopted as a baby will have even more intense feelings and emotions as they age, creating a complex situation for both the kid and their adoptive parents. A is 4 Adoption is here to help all parties involved during the adoption process, striving to deliver the best possible outcome for everyone. From comprehensive birth mother help to quality support for adoptive parents, our adoption center aims to beat any nearby adoption agency in California. After dealing with such a negative experience with private adoption, we decided to work on simplifying the process to get more amazing children into the arms of more loving parents. 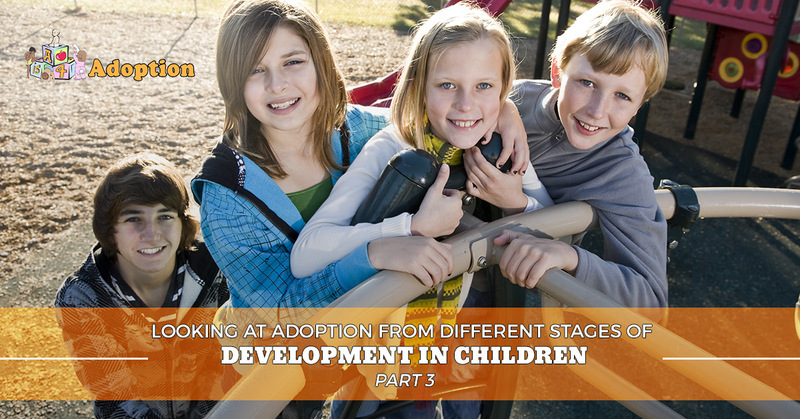 Today, we’ll conclude our series on the development of children and how that plays into their views on being adopted by discussing the adolescent years. If you are seeking comprehensive support as a pregnant mother or hoping to grow your family, be sure to contact us today for assistance! Any struggles during childhood that were not addressed may be aggravated as the child enters their teenage years. This time can be complicated, as adolescents often work diligently establish who they are as a person while also craving independence. A simultaneous struggle often ensues between the excitement of being an adult as soon as possible and holding onto the joy of childhood. The emotions associated with loss and a lack of control can come to the front as adopted teens try to reconcile that they are losing the simplicity of being a child. However, the drive to be an adult and thrive independently can be great. While configuring how all of the pieces fit, your teenager may be cold and distant. Rebelling against the parents may seem common, but with adopted children, it can be more complicated than people realize. Becoming an adult often pushes adopted adolescents to figure out every aspect of who they are. This concept includes learning as much as possible about their biological parents, where they came from, and how big of a role their genetics play. Parents who have not been very open about the adoption process at this point may learn that their kid is seeking answers on their own. The prevalence of social media and easy access to the internet ensures that finding your biological parents has never been easier. Learning about the balance of nature versus nature becomes a common activity, as adopted teens will be actively comparing the similarities and differences between their biological and adoptive parents. The quest for finding one’s identity will be at the core of numerous struggles for your adopted teenager. While they are looking to learn more about their biological parents, it does not mean that they are seeking the parental role from their creators. Adoptive parents will need to understand this natural inclination for finding one’s true roots is natural, and can often be turned into a positive experience for all parties. Your child may feel that they are missing a major piece of the puzzle that is their identity, and finding their biological parents will help to put the curiosity and concern to rest. As the parents, you can work to help your child in this journey, offering information and support when they are looking for it. The challenges faced by adopted children and their new parents will change and evolve over time as the child grows and matures. Each stage of development can provide new and unique dynamics that the family can help to foster for a positive experience for everyone involved. As your child gets older, his or her curiosity will evolve to take on more complicated notions and events to explain his or her place in the world. It’s important for parents to be supportive and welcoming throughout the process, taking their child’s feelings of grief and isolation seriously at every stage. Being prepared can prove to be very beneficial for the parents and other siblings. Raising a child is a lifelong learning experience, and keeping current on adoption and its unique challenges can prove to be a great way to optimize your family dynamic. The act of adopting a baby can be seen as a true expression of love for the birth mother and joy for the adoptive parents. Throughout his or her life, the child will face unique obstacles that can be the cause for a wide range of feelings and emotions. It’s important to be supportive and patient during these times. A is 4 Adoption is your source for private adoptions nationwide. Our experienced team is here to facilitate the process in an improved fashion over any adoption agencies in California, minimizing the complications while easing stress and providing quality assistance. Contact us today to learn more!